The popularity of men’s grooming products businesses like Harry’s Shave Club, the Men’s Shaving Club and other subscriber retail products have perked up the category in the last few years. So, onward and . . .downward. A San Diego company called Manscaped Inc is cutting a new path for men’s grooming products by concentrating on the male area that once would have been unmentionable in polite company. It seems that area of a man’s body hasn’t gotten much marketing attention. Though there are plenty of men’s beard and body trimmers on the market, when New York magazine’s online vertical The Strategist compiled its list of "The Best Manscaping Tools," it chose several men’s shavers but picked the Manscaped Lawn Mower 2.0 as the “best groin trimmer,” crediting its thin blades that don’t pull or yank at hairs in the pubic area. There really don’t seem to be any other trimmer that so bluntly states its purpose. What the company — quickly — discovered is that some men were just waiting for a product like that to be available. 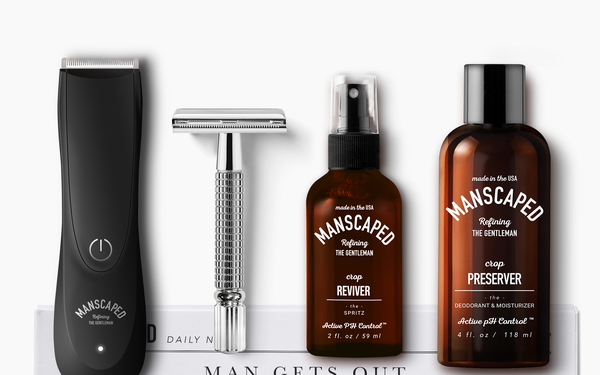 Manscaped had seven figure revenues the first year, eight figures in 2018 and expects nine figures by the end of this year. It advertises heavily on social media, Tran says. Many of Manscaped’s YouTube videos contain endearing euphemisms for the male pubic area — like “the zone below” — which has rarely, if ever been addressed by specific mass market products. “Women have been used to this for years. But men want to feel confident, too, really, when they pull their pants down,” Tran says. The Perfect Package 2.0 + Peak Hygiene Plan costs $74.99 to new members. It features The Lawn Mower 2.0, an electric trimmer; The Plow, a safety razor; the Crop Preserver, an “anti-chafing ball deodorant”; the Crop Reviver, a toner and refresher for "highly sensitive" body areas; and three disposable shaving mats. Every three months, Manscaped sends out new trimmer blades for $14.95 unless you tell them to stop.